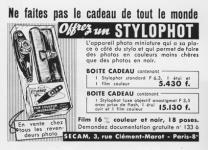 Manufactured in France from Circa 1955 until Circa 1963. Mc Keown judge it big compared to other “pen” cameras in Europe. Why not? But remains that it bears all the same well its name, with its small fastens which makes it possible to hang it in a pocket of jacket. The film is special, of the 16 mm which makes it possible to take to 18 photographs of 10 mm X 10 mm. The winding and the advance of film are done while inserting and by drawing the metal part located at the top of the camera. The remainder of the body is made of bakelite. There is only one speed (1/50), the lens f6,3 is fix-focus and not really terrible with the statements of its preceding owner. The whole weighs 85 grams. 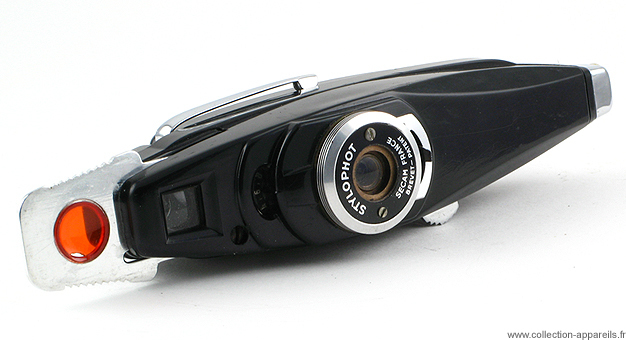 The shutter release is visible on the left of the camera, and as the staples is on the right, it clings perfectly outside a left inside pocket. One open his jacket, one shut, one closes again… the photograph is taken. There is a version “Color” and a version “Luxe” technically more elaborate. 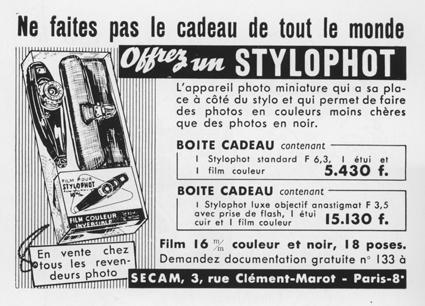 Fritz Kaftanski deposited a patent for a camera of this type and a stereo model. You can consult them here.